The Scottish Vocational Qualification (SVQ 3) in Emergency Fire Services: Operations in the Community at SCQF level 7 allows candidates to demonstrate competence in job-related skills in their particular area of work and expertise. The qualification covers areas such as: taking responsibility for effective performance in fire and rescue; searching for, rescuing and supporting endangered life; resolving fire and rescue operational incidents; protecting life and the environment from the effects of hazardous materials; and maintaining readiness for fire and rescue operational response. This qualification has been designed in partnership with the Skills for Justice Sector Skills Council to ensure relevance to the sector. 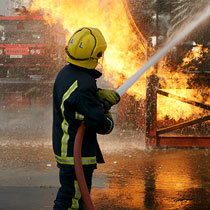 This qualification is available through The Scottish Fire and Rescue Service. This SVQ could be delivered by colleges and training providers which meet the approval criteria. Learners will gain a recognised qualification which guarantees that they have the skills, knowledge and abilities required to carry out their role successfully. Employers will also benefit from their employees being proficient. The SVQ is offered in the workplace. As assessment is carried out in the workplace this minimises any time learners would need to be away from their work. Who does this qualification suit? The SVQ 3 Emergency Fire Service: Operations in the Community at SCQF level 7 consists of five mandatory Units and two optional Units.